Princess Rinda of Balinore knows of only one way to get her cold father’s attention – to be an obnoxious, spoiled princess. When she finds out that the king plan to marrying her off to a far-flung nobleman, she puts on her best bratty show in front of the entire court. But Rinda’s plan backfires, and she soon finds herself married to the most ineligible man ever. Her new husband is monastery raised, poor as dirt, and a traveling minstrel. A very, very bad traveling minstrel. 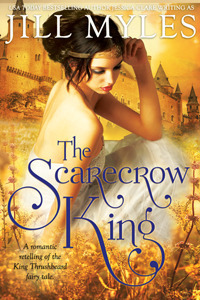 The Scarecrow King is a romantic retelling of the King Thrushbeard fairy tale. I picked this book up out of the blue. I knew nothing about the author. The only thing I knew was that this is a fairy tale retelling of the King Thrushbeard. However I haven't read The King Thrushbeard so technically I had no idea what the story was really about except what the synopsis told us. Since I knew nothing, I went in with no expectation. And oh my, once I started I couldn't put the book down. It's one of those books that you keep saying 'just one more chapter' and you stay up all night reading it. The story is so engaging, I was hooked right away. Princess Rinda will make you laugh and Alek will melt your heart. It's a quick read but it's enough to make your heart flutter. I'm completely satisfied with the ending and even after finishing The Scarecrow King the smile is still there on my face. I don't want to go into the details about the characters or the plot because it'll ruin the story. So I'll stop here.